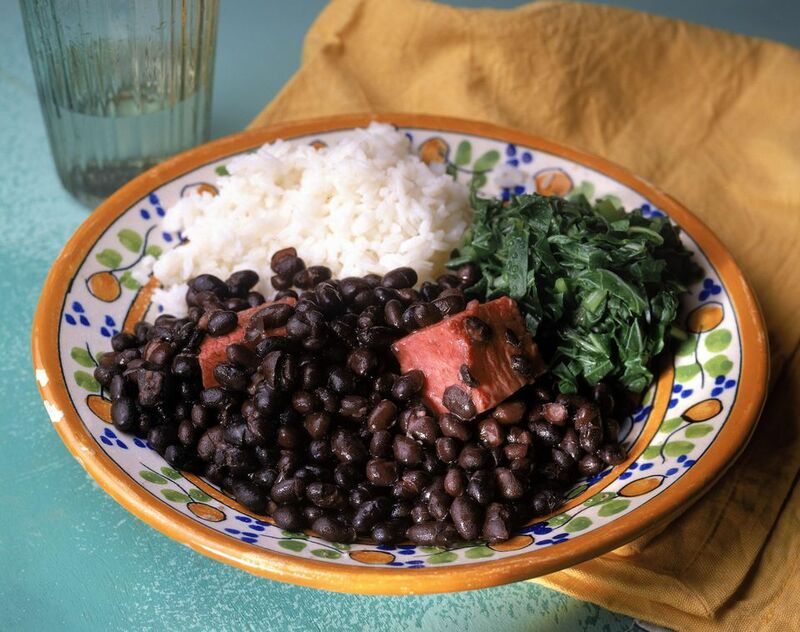 Feijoada is one of Brazil's national culinary treasures. This is a dish that is meant to serve a large group of family and friends, and the preparation traditionally begins one or two days before the event. Several kinds of smoked meats, ribs and beef jerky are slowly simmered with the black beans. When they're done, the meats are removed and served separately on a platter. In a separate bowl, soak the beef jerky overnight, changing the water two or three times. Place the beans in a large pot and cover with water. Add the dried beef and ham hock. Simmer for 2 hours or until the beans are cooked but firm. Remove the ham hock and discard. Add the ribs, chorizo, sirloin or pork loin, bacon and smoked pig or tongue, if desired, and the bay leaf to the beans and simmer for 30 minutes, adding hot water if necessary to maintain an inch of water over the beans. Heat the oil in a skillet and cook the onions and garlic until soft and golden. Add the parsley, and season with the cumin and salt and pepper to taste. Add 3/4 cup of the bean mixture to the skillet and mash the beans with the onions. Add this mixture back to the beans and meat and simmer for 30 minutes more. Remove the meats from the beans and cut them into smaller pieces or thin slices. Arrange the meats on a platter, grouped by type. Serve the beans in a separate bowl. The traditional accompaniments are Brazilian-style rice, collard greens, farofa (toasted manioc meal), hot pepper sauce and orange wedges, which are thought to help with digestion. If you'd rather not serve these traditional Brazilian sides, serve white rice with butter, salt, and pepper or seasoned with onions, garlic, cumin and cayenne pepper; fresh green salad with chipotle dressing; and cornbread or corn muffins. If you're a beer aficionado, serve this hot and spicy dish with a stout or brown or pale ale. If you're a wine drinker, a big red is the thing to choose. Pick from a malbec, tempranillo, zinfandel, syrah or shiraz, or a blend that is heavy on any one of these. All will taste great with this hearty dish.